At that point, the action unfolded for two months on ESPN, building the tension, drama, and excitement. Millions watched ESPN in the early fall, no one knew who the winners would be, and everyone formed opinions of who would win and why. In November, the event was hosted in the Penn & Teller Theatre, which was filled to capacity with over 5,000 cheering, poker-crazy fans who were there to watch the spectacle unfold live. Players from foreign countries showed up with rowdy entourages from their home countries who waved flags and painted their bodies. I was sitting in the special spectator seats on stage with Daniel Negreanu, Chris “Jesus” Ferguson and Johnny Chan. My money was on Canada’s Scott Montgomery to lose a mountain of chips trying to carry out some sort of crazy bluff, and he didn’t disappoint when the following big money hand came up against the Russian powerhouse, Ivan Demidov.With the blinds at $300,000-$600,000, Montgomery made it $1.7 million to go in the small blind with Ad-9d. In the big blind, Ivan Demidov of Russia called the $1.7 million and raised it up $3.8 million more! And we’re off to the races, folks! As we watched Ivan’s play, Chan whispered to me, “Look at Demidov’s face, it is turning red from his heart beating so hard because he is nervous and he has a super-strong hand.” And then Johnny observes, “Now look, his heart is pounding so hard that you can see his sweatshirt moving! One hundred percent he is super strong! If he were bluffing then he wouldn’t be nervous.” As a minute passed, I thought this might be the hand where Montgomery blew it. But why would he? 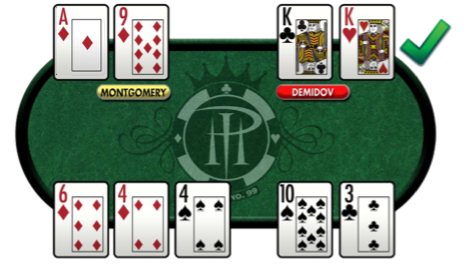 Montgomery had won seven out of the last ten hands by playing super aggressively. Why couldn’t he simply fold this hand and be happy with over $32 million in chips, which would have been second place at that point? Then, it happened. Montgomery announced, “I’m all in.” And you know what Demidov did? He immediately called! He quickly flipped over pocket kings! Chan was right! And then the world was shocked to see Montgomery’s Ad-9d! 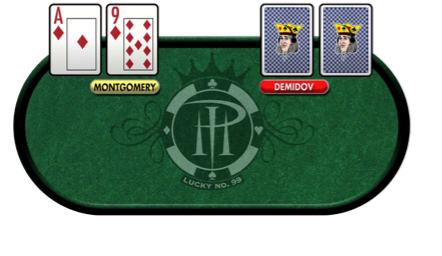 Now, you have to understand, Montgomery had made a huge blunder, but he could still win this pot and bust Demidov. Clearly Demidov is the 4 1/2 to 1 leader out of the gate here… but this is poker after all. Now here comes the flop: 6d-4d-4s. WHOA!! Can you believe it? Now Montgomery has a flush draw!! Did I mention there was $52 million in the pot?? Then the next two cards came 10s, then 3c, and Montgomery missed his flush. What a win for the Russian delegation! They cheered like mad in the theater! Let’s take a closer look at this hand. I like Montgomery’s opening raise of $1.7 million. But I’ve gotta say that I LOVE Demidov’s $3.8 million re-raise. Demidov must have been waiting all day long for an opportunity to re-raise the super aggressive Montgomery, and he was certainly hoping that Montgomery would move all in from there. I hate Montgomery’s all-in re-raise here. There’s no way around it. Terrible move. Just fold! Especially considering that all of the players knew how aggressively he was playing (that’s an important lesson: know your table image). And, it was only the second time in ten hours that he had been re-raised. I mean, hello!? Why stick $26 million into this pot?? At any rate, this was a spectacular and completely mind-numbing win for Demidov ($52 million!). I had picked Ivan to win it from the start, but sitting there in the crowd watching him take down Montgomery here was impressive. By the way, Montgomery is a nice guy and has real talent. And another thing… it’s fun to watch a poker game when you’re sitting with guys named Chan, Ferguson and Negreanu!